If you've been following my blog for a while, you may have noticed I am a bit of a sucker for funky flavored bubble gum. I've told you about my Hamburger Gum obsession and 'fessed up about my fascination of Gatorgum, Hubba Bubba and Freshen Up. I have recently rediscovered a traditional Florida souvenir I loved as a child, orange juice flavored gum. Back in the early 1980s, we could purchase this gum at our local candy stores. 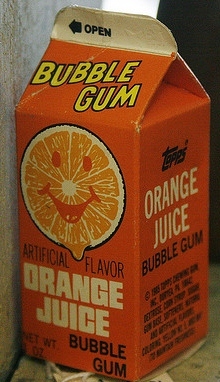 Cutely packaged in tiny orange juice cartons, Topps brand Orange Juice flavored bubble gum was so juicy and delicious. You would open the carton like you would a normal-sized juice carton and pour the candy into your mouth. I think the gum came in the form of tiny nuggets and although each nugget was packed with orange flavor, that flavor, like most bubble gums, faded within a few minutes. I remember orange juice gum! It was definitely one of my favorites. I loved how the gum came out of the carton like a real orange juice carton and yes, if I remember correctly, the gum was shaped like miniature orange Chiclets. I always bought this stuff and was always disappointed that the flavor faded fast and it was lousy for blowing bubbles, but I kept buying it anyway because the packaging was so cute. I still have to fight to resist it now even though now I should not have it due to an allergy. I prefer it with the heavy pulp! Thank you for posting this. I kept having this vague memories of gum that came in a little carton but for the life of me could not remember. I remember these. They still sell them from time to time where I live. Grape too I think. Ha! I was just online looking for a place to sell my little "Orange Juice Bubble Gum" which I've had since the 80s. Funny to find your post. I loved that gum. It also came in apple & grape flavours. Wow, I'm from The Netherlands (Europe) and bumped onto your picture of the orange juice gum, which is awesome! I have been googling for it a couple of times but without succes. Then to see this by accident! It was a pretty obscure candy over here, only for sale in smaller shops, not in big supermarkets. Thanks for sharing this, and now I know it was NOT something I imagined! Please tell me where I can find this! I have been looking everywhere for the pink lemonade kind and of course the other four flavors but mostly pink lemonade. Where can I buy this now?? ?